Pierata's runs at Doomben have been very exciting over the last month. One hiccup with the starter in Brisbane last start, but overall a a faultless performance by Pierata. The confidence show by his trainer early, is now been seen by all and his runs are on the board. He will be one of the horses to beat in the $2million Magic Millions 3YO Guineas on Saturday week. Pierata jumped smartly for Corey Brown from gate 11 to go forward and settled fifth before drifting back to seventh before the turn. When asked to accelerate, he dropped his rivals quickly and powered clear to win the 1350m sprint by 2 1/2 lengths. 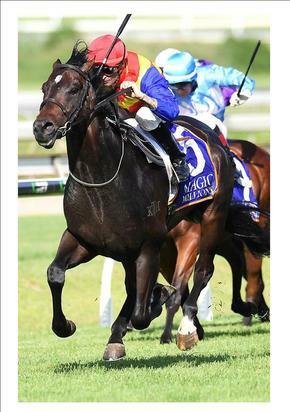 Pierata was a dominant winner in the Group 3, BRC Vo Rogue Plate at Doomben last Saturday. This was his first win at Group level. Pie was Group 2 placed last season at his first attemp of group level racing. 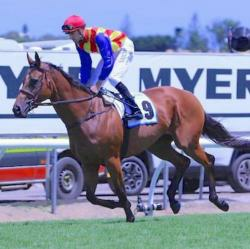 Pierata has the overall record of 3 wins and 2 placings from 7 starts with prizemoney of $276,650.00.